For some time now I've been bullish on Cam Newton and his chances to succeed as an NFL quarterback. Newton's path through the world of NCAA football was one-of-a-kind, and it has been chronicled at length by those closer to the situation than me. But what he did from January 2010 to January 2011 was something special, an exceptional season with a great completion percentage and 30 TDs against just seven interceptions. His leadership shown under pressure, down 24-0 in Tuscaloosa against Alabama and leading Auburn roaring back for a win, was the stuff of movie scripts. So it made me happy yesterday when Cam Newton had a great workout in San Diego according to all in attendance. SI's Stewart Mandel wrote on Twitter, "Cam Newton held a workout today and now he's a Top 5 pick." It validated what I thought about Newton from seeing him perform at such a high level this season. I feel confident that Newton is the most NFL-ready quarterback of any eligible to be taken in the 2011 Draft. My friends know that I run Draft King, and to no surprise the topic of the NFL Draft comes up fairly often in conversation. There are some who have told me that they believe Cam Newton "doesn't have it between the ears" and that he's "Vince Young 2.0" -- and the Young comment wasn't meant as a compliment. 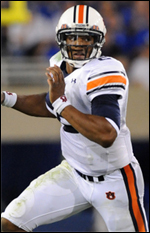 Nevermind that Newton showed the capacity to learn an offense and then execute it within the course of eight months at Auburn and perform at a masterful level after just a few games. But while Newton had a great workout, NFL Network's Mike Mayock offered a cautionary tale about it, noting that JaMarcus Russell also had a fantastic workout prior to the 2007 Draft. Mayock is right that workout warriors don't necessarily equate to NFL success, but to me the fact that Newton had a great workout after what he did this season just makes him look that much stronger as a prospect. Things have been less encouraging for another SEC quarterback to declare for early entry into the NFL: Ryan Mallett. The strong-armed Mallett was recruited out of Texarkana to play for Lloyd Carr at Michigan. Unfortunately for Mallett timing was not on his side, and when Carr was ousted from the head coaching spot at Michigan and replaced by Rich Rodriguez, Mallett transferred to Arkansas. During his two years at Arkansas, Mallett developed into an effective quarterback who, as he developed his skills, improved on his accuracy, particularly on intermediate passes. On paper, a 6'6" 240 pound QB with a cannon arm and good accuracy should be a first round pick. But, at this point, it appears that Mallett will not be taken in the first round of the draft. Why? There are some concerns about his fundamentals, particularly his footwork in the pocket. Mallett, or Big Tex as he is known in some circles, is a substantially slower runner than most of the other top QB prospects in the draft. But with his size, his cannon arm, his durability, and the fact that he threw for 66.5% last season and a career 60 TD against just 18 interceptions during his two years playing for the Razorbacks, you'd think there would be more buzz around him. Perhaps "buzz" isn't the best word to use in this situation, though. There are whispers surrounding Mallett, rumors that he has been witnessed using marijuana and cocaine. There is no evidence in the above story other than unnamed sources, and the report notes that Mallett has denied the claims. But it's a concern, particularly with the NFL's drug policy being so strict -- with the potential to become even stricter under the next collective bargaining agreement. How bad could it get for Mallett? There is speculation that Mallett could slide into the third round, an unfair place for him to fall based on his pure athletic skill. But the NFL is an ultra high stakes business, and risk aversion is a concern for every team. Rest assured that Mallett will be asked about the rumors of drug use by various NFL general managers during the battery of interviews that await him. Think they won't press him on that? Just last year, Miami Dolphins GM Jeff Ireland asked Oklahoma State WR Dez Bryant if his mom was a prostitute. Almost nothing is off limits when it comes to teams that will be making major investments in players who haven't seen a single down of NFL action. The reality for Mallett is that he is an excellent NFL prospect whose only scrape with the law was a 2009 arrest for public intoxication. I'm the first to admit that I value Mallett more than most other draft prognosticators, if for no other reason than I saw him raise his game in 2010 to the point where he was able to handle the SEC's elite defensive competition with relative ease. He lead Arkansas to a comeback win at Georgia, a victory that showed me that Mallett has what it takes to be tough under pressure. But, as always, I'm not an NFL owner or general manager, so my personal opinion is of minor importance. What is of major importance is that Mallett make some good impressions during his interview time with various NFL teams, particularly those franchises in need of a top flight quarterback prospect. Mallett just needs one team to believe in him to end up going in a decent draft position.